When you view VWO reports data using Google Analytics (GA), you may sometimes notice that GA has reported an increase in the bounce rate and page engagement. Although the bounce rates and engagement may not have increased, GA reports might display an increase. This occurs mostly when you are running a split URL campaign. If the redirection occurs within the same domain, GA tracks the event as page engagement. If the redirection is to a different domain, GA tracks the event as the bounce rate. VWO does not provide a direct metric or feature to measure bounce rates. However, you can easily integrate VWO with Google Analytics (GA) or other third-party tools that can help you analyze the bounce data. Alternately, you can also track bounce data in a test by setting up ‘Engagement Goal‘. The engagement goal is triggered when a visitor interacts with the website where the test is running. You can analyze the data to view the number of visitors who engaged with the website against the number of goal conversion number. I have installed the smart code, but it is breaking the HTML code validation on my website. Please reach us out at support@wingify.com for any queries. I am using VWO on my website, but when I try to open a page, it shows blank screen. VWO smart code is added twice on the same page. 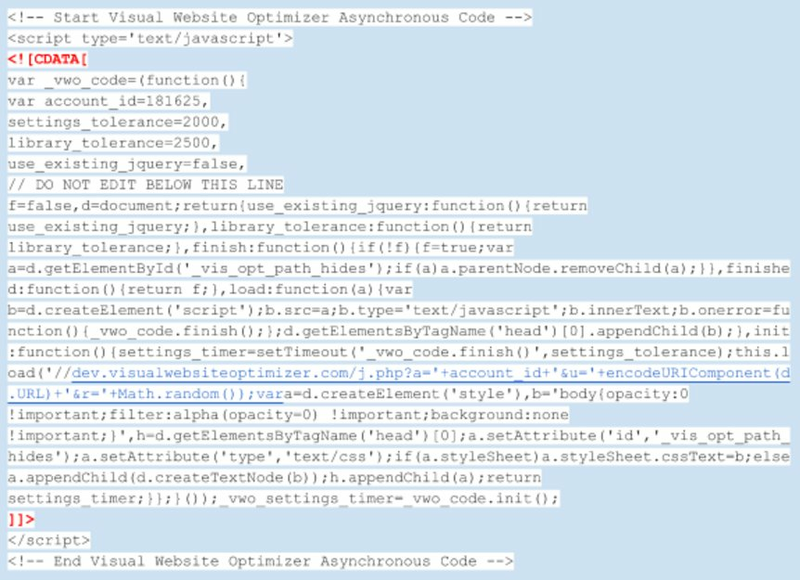 Make sure that you have only one instance of VWO smart code on a webpage. DOM-ready event fails to fire on the page for some reason. Click here to know more about DOM events. We have smoothly tested and implemented real-time behavioral targeting, semantic targeting, and other advanced analytics technologies that exerted tremendous load on the servers. You can check our ping-time statistics here.